The first lesson of small business is you've got nobody to blame but yourself. When my staff make mistakes, it's my fault. When an employee turns out to be a bad apple and steals from me? Still my fault, because I hired them. When the world collapses and my community has become cannibals? My fault for not anticipating the demand for food. All my fault, today and every day. This first lesson is what separates us from the general population and creates an informal fraternity of small business owners. Our culture plays the blame game, but it's the only game we won't sell. The second lesson is: Life is unfair. It's entirely possible to do everything right and still fail (which is your fault, see lesson one). It's possible you have the same business model, with the same gray areas as everyone else, but someone decides to make an example of you. Talk to a store owner who opened right after 9/11 and you'll hear a story of perseverance or unfair circumstances that led to failure. 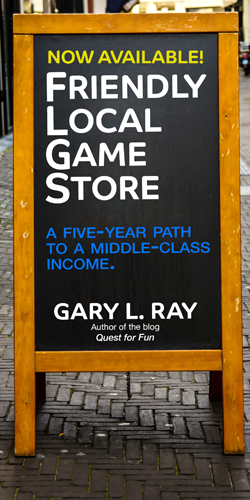 We did really well during the recession, but some communities in the exurbs simply disappeared, their inhabitants moving out in the middle of the night and their retailers left with no customers. Terribly unfair. And still your fault. If I had to propose a third lesson, it's this: Nobody cares. You're on your own. This third lesson is important because new small business owners forget the first two lessons and constantly complain. Because the trade is small and you may have only dealt with big institutions (schools, corporations, etc), you may be unaware of your ability to effect change by simply asking. Nobody cares, but you have some power to effect change. In every circumstance of my life before owning a business, if I was failing, someone would step in to help. Not small business. We're working without a net and nobody cares. The fourth lesson is a corollary of lesson three, which is: Everyone is here to make money. What they need to do to make that money, may or may not align with your desire to make money. When their needs don't align with your needs, the phrase we tend to use is "That's none of your business." Making money is extremely hard, with retailers in the 5-10% net profit range. Look at how hard it is to juggle your personal income without going into debt or going hungry. Now multiply that complexity by ten. That's what it's like for me to run a store. If you aren't doing it to make money, you better not have a lot of money on the table. That's usually the case. The fifth lesson is Everyone is here because they love their hobby. It's not always true and there are a few exceptions I can think of, but everyone got into this because they love hobby games and everyone stays because that passion gets them through the hard times. Sometimes they love their hobby more than they love making money, and sometimes it's the opposite. A big lesson I've learned from observation is a great company, be it a publisher or retailer, balances these two opposing forces in equal measure. Those who understand these five rules tend to be successful. They're not wealthy. They're not always happy. They are successful in their own ways and their like minded peers wish to associate with them. Those that don't follow the rules are left to scream into the wilderness until they understand it's all their fault, life is unfair, nobody cares, and it's time to get their act together and focus on their motivation and their bottom line.